Water restoration, fire restoration, and storm restoration – we fix it all at Archer Restoration Services. When your basement floods, or when flames and smoke wreak havoc on your kitchen, or when a wind-blown tree falls on your roof, that’s when you need Archer. With more than 50 years’ combined experience in the restoration business, Archer’s courteous, professional staff has the technical know-how to make it all new again. What sets Archer apart from other restoration companies in the Atlanta area? Plain and simple, we will be there when you need us. Archer is open for business 24 hours a day, 365 days a year, and your call will always reach a company employee – never an answering service. That cuts down on the response time, and we can make it to your door in less than an hour for most jobs. Water removal, floor repair, carpet cleaning, sewage cleanup, mold remediation, hardwood cleaning – no restoration job in North Georgia is too big or too small for Archer. Many restoration jobs require a diverse set of skills to complete, which is another Archer advantage – we are a full-service, licensed, residential and commercial contractor in the State of Georgia, so any repair or replacement work can be done without the hassle of hiring another restoration company. We also offer the convenience of direct insurance billing, so the client isn’t further burdened by having to deal with the adjuster. Our goal at family owned Archer Restoration Services is to provide the best service in the industry. 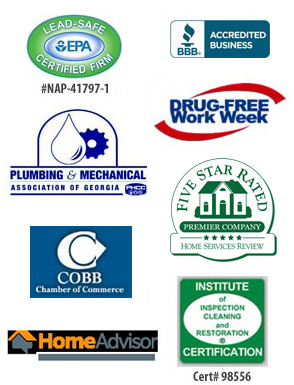 Our A-plus rating with the Better Business Bureau is an indication of that, but we invite you to contact us and find out for yourself what makes Archer the smart choice for water, fire or storm damage repair and restoration in Cartersville, Dunwoody, Austell, Powder Springs, Hiram, Lithia Springs, Smyrna and other communities throughout the Metro Atlanta area.